On the 13th January 2019, Goethe Open Space will present Li Hanwei’s solo exhibition "Liquid Health". Liquid Health is a fictional cultural and creative company established by the artist, which exploits Chinese culture to conduct brand development, thereby creating a cultural brand that is designed to cultivate the body-mind-soul-spirit of human beings. The exhibition entitled by the brand’s name will transform the entire office space into a private lounge of the brand, and also the latest product series of Spiritual Beauty Instrument will be launched on that day. Liquid Health is a product that was born for the fate of all mankind. It has been nourished by thousands of years of civilization and was founded in 2017. 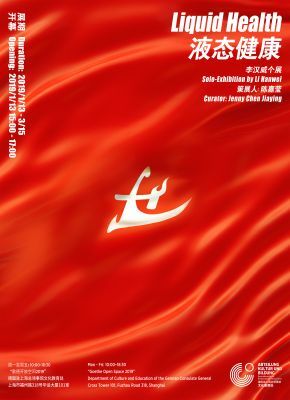 It aims at diffusing the artistic aesthetics of Chinese characteristics, and focuses on providing a fusion experience of Chinese culture for all living beings. The company takes this as its core mission, and produces various products to promote this lifestyle. Its predecessor was Liquid Health Agricultural Science and Technology Company, based on healthy raw materials production, today we have developed the latest spiritual beauty products. Despite different reforms and innovation processes, the fundamental philosophy of Liquid Health brand has never been changed, which is to help all human beings to create a spiritual experience of Chinese civilization. 1. WATER-RICH REPAIR SERIES: This moisturizing repair formula is developed by Liquid Health experts, and has been clinically proved to effectively repair mental state, and to foster a positive face life. 2. FO. 2210 (BUDDHA-LIKE 2210): This formula effectively combats various signs of mental aging, rejuvenate life, and easily improve the quality of life. 3. REGENERIST SERIES: The latest liquid technology can help human beings renew their inner spirits, to coexist next to each other, and even to shorten the distance between them. Spiritual beauty instruments were inspired by the provincial TV products such as the beauty mask instruments, eyes massagers and face lifting instruments stemming from advertisements the artist watched as a child. These ads usually arise from very spontaneous and shallow thoughts, and end up with shoddy produced “landscapes”. They also form the narrow core of “Chinese Dream, Blue Dream”. Together with the artificially high GDP and the overwhelming promotion of a great nation image their advertisers share a common enemy, and these circumstances form a strong contrast to the "American dream" that once tempted many people of the world. Ultimately, this exhibition may be seen as a confrontation between “Socialism with Chinese characteristics” and “American Imperialism." Li Hanwei chose to stand on a side more related to himself. This means that he does not observe these Chinese phenomena with a Western gaze, but rather adopts abundant local resources in his artistic work. By so doing, he emphasizes more the cultural landscape in China's special environment than just focusing on issues of pan-capitalism (like most post-internet arts do). If you would like to experience these cultural landscapes, just visit the Cross Tower at No. 318 Fuzhou Road in downtown Shanghai. Enter the lobby of this office building through the revolving door, and turn right into the “Liquid Health” high-grade private club. The first thing jumping into your sight will be the reception desk and the money drawing feng shui pool, which appear at the same time as our glittering brand logo. You can choose to stroll around, or lie on a comfortable lounge chair to watch the brand's promotional videos. All this creates the cultural ambience for our brand. Three brand new spiritual beauty instruments, as this time's blockbuster products released by Liquid Health, will provide unprecedented spiritual sublimation for customers by means of Chinese culture. Here, as a product, culture becomes purer and pleasing. The cultural impoverishment caused by the landscape will be compensated by a landscape correspondently. The healthy liquid, is the "zen" of lifestyle, "be water” encouraged by Bruce Lee, a cultural form that is floating and flexible, and it is also an anonymous thing, which is omnipresent, wrapping and pervading you. Born in Xuzhou, Jiangsu province in 1994, he graduated from Shanghai Institute of Visual Arts in 2018, and now lives and works in Shanghai. Li Hanwei's creation is based on adapting metaphors in the format of commercial advertisements and films by using computer technology to create a parallel universe closely related to reality. Taking this as the starting point, he has gradually founded different (fictional) brands to present today’s cultural forms and social landscapes in the practical and effective manner of publicity in the current society. He participated in exhibitions such as: "Hunting Cycle", MadeIn Park, Shanghai, 2018; "Shanghai Hot the Beheaded Six", Yell Space, Shanghai, 2018; BABEL7, Babelsberger Strasse 52, Berlin, 2018; "Diversity", École nationale supérieure d'art de Nice – Villa Arson, Nice, 2016. In 2017, Li Hanwei established the online contemporary art space Slime Engine and co- operates the space with Liu Shuzhen and Fang Yang. Slime Engine is dedicated to the development of unprecedented forms of art creation, exhibition, curating, and viewing. Through the communication and cooperation with other artists, the virtual world, which is not limited by time and space, but rather utilized to present more diversified forms of contemporary art. Li Hanwei has been involved in the conception and production of several exhibitions in Slime Engine such as: "Ocean", 2018; "Bysanz x 33EMYBW x Fang Yang Three-Person Project", 2018; "Li Jingxiong & ChillChill double solo show", 2018; "Remote Sensing", 2018; "Jurassic", 2018; "Hole", 2018; "Your World", 2018; "James Turrell's Meditation Space", 2018; "Nostromo Landing", 2017; "Space Station", 2017; "Baychimo", 2017; "Nuclear Magnetic Resonance", 2017.